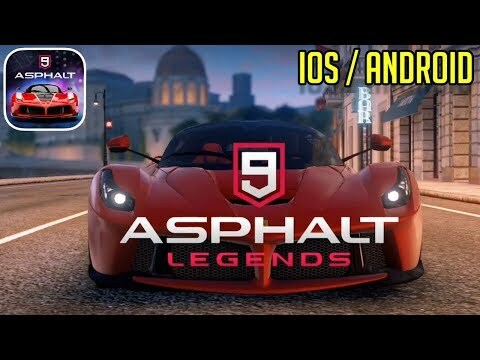 When we are talking about a good racing game, we are talking about Asphalt 9: Legends made by Gameloft. I remember the first games of this series and I was stunned by the graphics and the effects of this game. When you’ve got a stranglehold on one particular niche, it doesn’t make much sense to give it up. Gameloft has no intentions of doing so with its latest entry to the Asphalt series, entitled Asphalt 9: Legends. The franchise that started all the way back on the Nintendo DS in the bygone era of 2004 before moving to mobile has survived as long as it has by emphasizing high-energy, arcade-style racing over anything close to a driving simulation, but doing it in real-world cars. Asphalt 9 adheres to that winning formula with dozens of cars already available in soft launch in markets including the Philippines and Australia. The build Gameloft was showing off at E3 had several vehicles from each class in the game unlocked, removing the need to work for them that is generally a big part of free-to-play racing games. That said, it was cool to see all the customization options for them, including paint colors you’d be able to buy in real life ( you know, if you could actually afford to just roll up to the dealership and plunk down the dough for a Bugatti Chiron) and the ability to concoct just about any other color you could imagine. And now let`s see what we have here while we are in the gameplay section. As a direct sequel to Asphalt 8, Legends features the same kind of action movie- action driving that defined its predecessor. That means tons of boost, ramps, and jumps of various varieties, and dedicated virtual buttons to make you do 360 spins, the better to knock opposing cars out of your way. While stunts are optional, the fact that you earn more nitro to go faster means they sort of aren’t at the same time. The nitro pulse returns after taking the last Asphalt installment off, allowing you to go even faster when you activate its purple splendor. One of the big selling points of Asphalt 9 is the most options for driving controls in the series to date. The tap steering and tilt-to-steer choices should be familiar to anyone who’s ever played a racing game on a phone or tablet. The newcomer is called TouchDrive, and it’s an interesting addition for new players or anyone who might only have one hand free to race. Instead of controlling the car’s every move, TouchDrive presents you with two or three icons at the top of the screen that indicate if there are boosts or ramps coming up on either side of the screen or right down the middle. With a simple swipe, you send your car to that region of the screen, though you still have the virtual buttons to drift or activate nitro as needed. If a standard racing game and an endless racer could conceive a child somehow, TouchDrive would probably be the product of their genes. There are a lot of in-game purchases, which are very very expensive. What can I say? A great game. A little heavy for the most devices but it`s worth it. You can progress in the game without buying all expensive packs and so on, but it takes time. There is something for everyone in this game. You should try it.